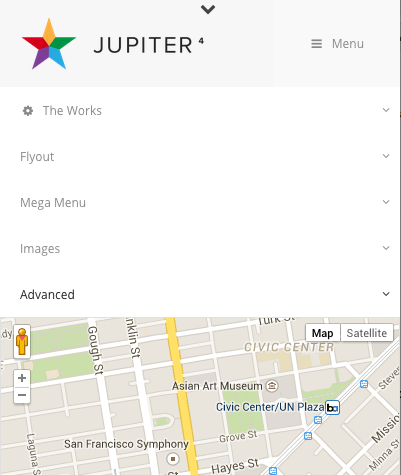 This guide pertains to installing UberMenu with the default Jupiter theme, in the primary navigation location. Because Jupiter has so many different template permutations, it is possible that other configurations may require Manual Integration, but with the out-of-the-box theme configuration, I have not encountered any conflicts. If you are aligning the menu to the right of the logo, change UberMenu’s Menu Bar Alignment to Right. Because Jupiter’s logo is positioned absolutely, UberMenu will overlap the logo if set to full width. Or, you can just disable it and use UberMenu’s search dropdown instead.